Cumberland Valley has long been known as a transportation hub. Intersected by the Great Road, the county has a long heritage of hospitality as taverns dotted the rolling farmland to accommodate early travelers. In 1798 Carlisle, the county seat, had 24 taverns and a population of less than 2,000. Records show that at least 55 taverns have stood in Carlisle, scattered throughout the 16 block area of old town. Of these taverns, 45% were stone, 24% log, and 15% were brick. Only about 10 of these buildings still stand today. The information below was compiled by the Cumberland County Historical Society. Photos, unless otherwise noted, were also provided by the Cumberland County Historical Society. To learn more, stop by History on High - The Shop, to purchase Taverns of Cumberland County Pennsylvania: 1750-1840. The Eastern part of this two leg tour leads from Carlisle to Dillsburg. Most of the taverns in this brochure are private residences. Please respect the privacy and property of these former taverns. Download now. Additional information can be found for taverns below, as well as a list of additional taverns not included in the brochure. See Tavern Tours West - Carlisle to Shippensburg. Jacob Weiser bought the lot from William Alexander in 1795. The property was sold at a sheriff&apos;s sale in 1802 to Michael Longenecker. The two story brick structure was built before 1798. Tavern Keepers: Jacob Weiser 1791+, Jacob Brandt 1798, Catharine Weiser 1800, Michael Longenecker 1801 and John Moser 1803. Also known as the Sign of Grayson&apos;s Hotel, The Carlisle Inn and Travellers&apos; Rest, Mansion House Hotel, Old Mansion House and The Union Hotel. The original two-story brick structure was built in 1798, and the current structure was in place by 1823. Tavern Keepers: John Hunter 1778-1798, Robert Grayson 1799-1801, John Hunter 1801-1806, Charles Bovard 1807-1812+, Barnet Aughinbaugh 1823-1825, Samuel Kling 1826, C. Garretson 1826, George Beetem 1830-1832, Barnet Aughinbaugh 1833, C.E.R. Davis 1835, George Beetem 1836-1841 and William S. Allen 1841+. The current building, the second on the site, was constructed about 1823. It was sold by the Sheriff in 1824 and included the two-story house, back buildings, a brick stable, tenant houses, barns, stables and a blacksmith shop. The tavern was advertised for rent by John Boden in 1823 and by John D. Mahon in 1824. Tavern Keepers: Daniel Wonderly 1801-1803, Nicholas Ulrich 1804-1805, John Miller 1806, Abraham Mayers 1809-1815, Henry Mack 1816, Samuel Swartz 1817, Jacob Mach 1820, John Boden 1821-1823 and John Brannon 1825. This surviving two-story brick structure was built c. 1803. 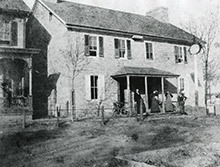 Jacob Matter&apos;s 1803 tavern petition states that he had erected a large, spacious two-story brick house on the main road from Carlisle to Harrisburg. It included 213 acres in a sale advertisement after Matter&apos;s death in 1813. In an ad in 1830, the tavern was referred to as the "None Such". Tavern Keepers: Jacob Matter 1801-1813, Elizabeth Matter 1813, James Quigley 1815-1816, Matthew Gould 1817, Jacob Smith 1818, George Sponsler 1820-1827, Jacob Wetzel 1829 and George Sponsler 1829-1835. This two-story log tavern was the first opened in what is now known as Mechanicsburg and operated 1801-1809. The building was found within the walls of a dismantled building and moved to its current location. 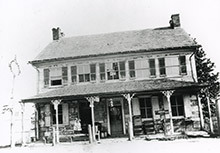 The tavern was named after the operator, George Frankenberger, and is now operated by the Mechanicsburg Museum Association. Tours are available Saturdays 12-3pm May-October and during special events. 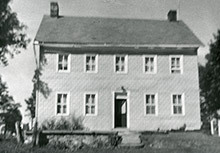 The two-story log house was the first in the town to be used as a tavern beginning in 1822 on a heavily traveled road. Abraham Paul&apos;s application in 1835 was denied because of testimony regarding his not being fit to operate such a business. He died in 1838, and it was subsequently used as a tavern or hotel for many years by a succession of owners. Tavern Keepers: Abraham Paul 1822-1835, David Martin 1827 and Mary Paul 1838-1840+. The two-story stone building was built between 1810 and 1815. The 1798 Glass Tax mentions a two-story log house at the site. Much of the original interior is intact including a moveable board wall on the second floor. By 1835, the present frame addition was added. The stone barn is also an historic building on the opposite side of Trindle Road. In 1845, an Orphan&apos;s Court sale indicated that the property included 145 acres, the house and kitchen with frame dwelling house attached, a large stone stable, a convenient frame and log barn, a blacksmith shop, two wells of excellent water and a fine orchard. Tavern Keeper: Thomas Williamson 1796-1825. This two story log building was built about 1814. The original tavern had two rooms on each floor. It still retains beaded board walls on the second floor, chair rail and several original doors. The property was sold at an Orphan&apos;s Court sale in 1839 to Cyrus Ringwalt. Tavern Keepers: Henry Shaeffer 1814-1818, Jonathan Kitzmiller 1820-1836 and David Sterrett 1837. This is the other brick house associated with the Sign of the United States Frigate (see additional taverns near the end of this page). No name has been found for the tavern although it may have been known by the name of the tavern keepers - Webbert&apos;s Tavern or Brown&apos;s Tavern or Reichert&apos;s Hotel. Melchior Brenneman bought the lot from Matthew Miller&apos;s heirs in 1820 and sold the property the next day to Melchior Webbert. In 1823, Webbert sold it to Martin Fry who then sold it to John Richert. The 1858 Atlas of Cumberland County shows it as J. Richer&apos;s Hotel. Tavern Keepers: Melchior Webbert 1830-1838, William Brown 1838-1840+. The stone two-story house was built prior to 1796. Jacob Welsh purchased 350 acres of land called "Carlisle" from Thomas Martin in 1783. Abraham Herr purchased the property in 1796 from Welsh. Herr moved to Carlisle in 1802, died in 1804 and left the property to his son Abraham. It does not appear that it was used as a tavern after Herr&apos;s death. Tavern Keepers: Jacob Welsh 1791-1793, Abraham Herr 1796-1802. This log building was built in two stages. The section to the right was originally 1 ½ stories. An attached kitchen has been removed. The section to the left of the front door was built around 1804 and contains two rooms on each floor with original door locks, hardware, board walls and fireplaces. Robert Leech kept a tavern near Dills before coming to Cumberland County. His 1804 license application indicated that he built the house. After Cook&apos;s death in 1836, the tavern closed. Tavern Keepers: Robert Leech 1804-1811, John Young 1811, Margaret Leech, widow, 1812 and Robert Cook 1815-1836. This site was acquired in 2001 by the Northern York County Historical and Preservation Society through the generous gift of Charles and Lucille Vogelson. The earliest section dates from 1794, replacing an earlier log tavern on the site, built by John Dill, grandson of Matthew Dill who settled close to the spring here in 1742 on a 500 acre tract. Leonard Eichelberger purchased the plantation in 1800 and the tavern had additional sections built in 1800 and 1819. Tours can be arranged and the site is open for special events throughout the year. The Sign of the White Horse is a two-story log structure currently covered with stucco and siding. David White and Lewis Lewis purchased the lot in 1784 and sold half of it to David White in 1786. The only innkeeper was Lewis Lewis from 1784-1787. Although recently renovated, the original two-story stone house with a one-story log kitchen still stands. It was built by Matthew Allison between 1788-1797 and Robert Taylor was the tavern keeper from 1806-1822. Taylor rented the tavern from the current owner at the time, David White, and in 1814 purchased it from White&apos;s son. It was sold by the sheriff in 1822. John and Jacob Crever purchased adjoining lots in 1774. John sold the tavern section of the property to Jacob in 1796 who in turn sold it to Philip Lauffman. Tavern Keepers: Jacob Crever pre-1798, Philip Lauffman 1796-1798, James Craighead 1798-1803 and Conrad Gross 1803. A date stone on the two-story house reads Charles McManus 1803. Tavern Keeper: Charles McManus 1803-1817. James Bell&apos;s son Thomas petitioned in 1807 to keep the tavern at the Sign of the Rattlesnake. He renamed it when he took possession. Tavern Keepers: James Bell 1780-1807 and Thomas Bell 1807-1813. Also known as Slonecker&apos;s Inn. The building was constructed c. 1790 by Benjamin Junkin. In 1811, the property was for sale after Junkin&apos;s death in 1807. The property included an excellent well with pump, frame barn, frame stables, milk house, smoke house, large stone blacksmith shop and orchard. Tavern Keepers: Benjamin Junkin 1798-1806, Agnes Junkin 1807-1811, John Smith 1812 and Jacob Slonecker 1831-1834. Also known as Sign of General Green. The tavern that stood at this site was a two-story stone house. The property included 150 acres in 1805 according to an advertisement. Tavern Keepers: John Walker 1782-1795, Thomas Carothers 1798-1805, James Bell 1805-1813, Robert Smith 1814, Henry Wertz 1818, William Good 1820 and George Ewing 1822-1823. This surviving tavern building dates to 1790. It was listed in 1798 as a two-story stone building. Alexander Wills purchased the property and placed it for rent in 1834. Mary Bower called it the Sign of the Buck. Tavern Keepers: Jonathan Hoge 1801+, John Moser 1804-1805, George Bower 1806-1807, Mary Bower, widow 1807-1810, Howard Moore 1813, Dennis McElroy 1815, John Waugh 1817, Frederick Rupley 1819-1821, Mathias Swiler 1822-1829, Jacob Hoyer 1829-1833 and Thomas Craighead 1834. The tavern described by carpenter Thomas McDannel was two-stories containing eleven apartments of good size; it was substantial and well built. In the 1858 Atlas of Cumberland County, Grier&apos;s Hotel is shown on the right hand side of the road going towards Carlisle. The building no longer remains. Also known as Negley&apos;s Tavern and Trindle Spring Tavern. This two-story building was built in 1800. The building no longer remains. Tavern Keepers: Jacob Stahly 1805, George Bower 1805, Daniel Negley 1809-1814, Elizabeth Negley, widow, 1814-1815, William Hinney 1817-1827, John Markley 1828 and Joseph Strock 1834-1858+. The log tavern at this site was removed several years ago. It continued to be operated as a tavern until the 1970s. J.W. Leidig&apos;s tavern and store are shown in the 1858 and 1872 Cumberland County Atlases. Tavern Keeper: Michael Leidig 1825-1841. Also known as Sign of the Black Horse. Originally a two-story brick building owned by Matthew Miller, this tavern burned around 1901. When Miller died in 1823, his heirs offered the sale of this tavern property consisting of 232 acres, 37 perches, a large two-story brick house, a large bank barn and stable, the tavern across the street and it&apos;s shed and out houses, a blacksmith shop, large apple orchard and a well. The barn still stands. Tavern Keepers: Jacob Stouffer 1811, Abraham Rupley 1816-1826 and George King 1826. The two-story stone house was received by John Meixel from his father-in-law George Gyer in 1808. Records indicated he built the house about 1816. Tavern Keepers: John Meixel 1821, John B. Garber 1821 and John Meixel 1825. This un-located log tavern building site was sold by Martin Brandt on the south side of the road from Carlisle to York to George Smith in 1815. Daniel Worley purchased the property in 1819. 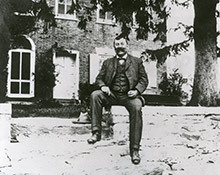 He sold the two-acre lot in 1836 to David Brandt. In 1841, David Brandt is still being assessed for the tavern. On some older maps the area near the tavern is known as Worleytown, on other as Brandtsville.